our bathroom renovation is complete. 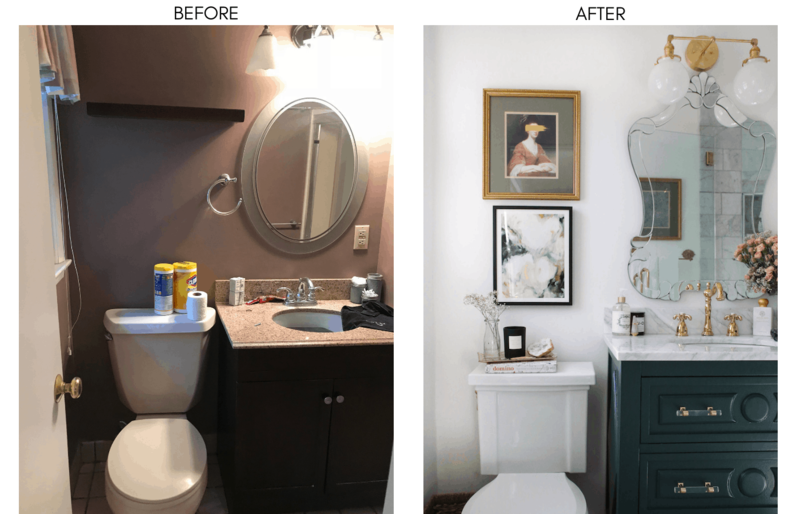 So much frustration, stress, anxiety and overwhelm were accompanied by this project and what you won’t see in these photos is the blood, sweat, and (many) tears that were poured into this tiny bathroom. With a full-time job and a side biz, this was completed on nights, weekends and PTO days in a few weeks time. After the demo, I somehow convinced my husband, Angelo, to let me continue with the remodel on my own and pull him in when needed. I wanted to prove to myself that I could do the work on my own and so…that’s what I did. 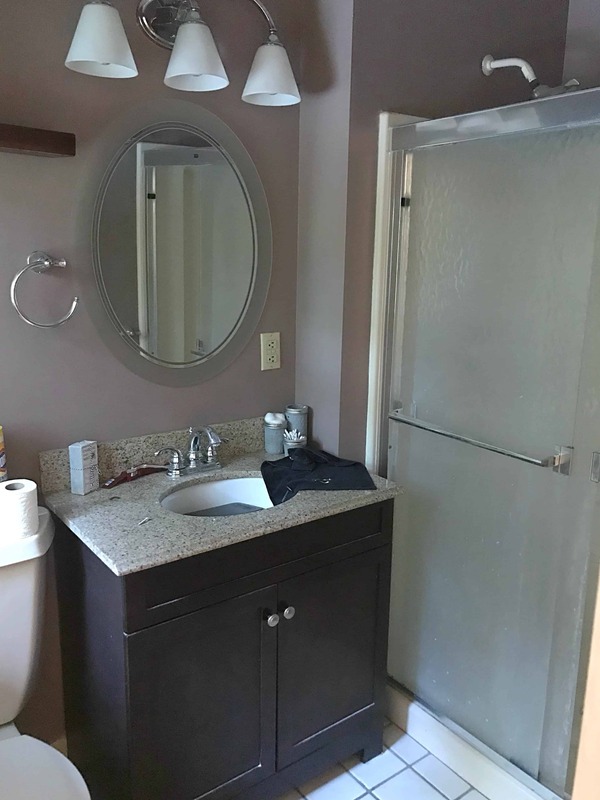 I tackled the drywall, shower pan, waterproofing the shower, cutting and laying 105 sq ft of marble, sanding and painting four coats on the vanity, grouted the marble and installed the fixtures (minus the toilet and glass door – we hired out for that) – all over the course of a few weeks. And I should note that not a single thing went according to plan. It was one of the toughest mental and physical rollercoasters that I (nor my hands) wish to not ride again anytime soon, but the outcome was worth every second. Nothing like an old beige fiberglass shower to wake you up in the morning (for the record, we never once showered in here). I was inspired by a few photos (see week 1 post) and ended up changing my mind on some things along the way, but ultimately, the final design is one that we will adore and cherish for a long time. 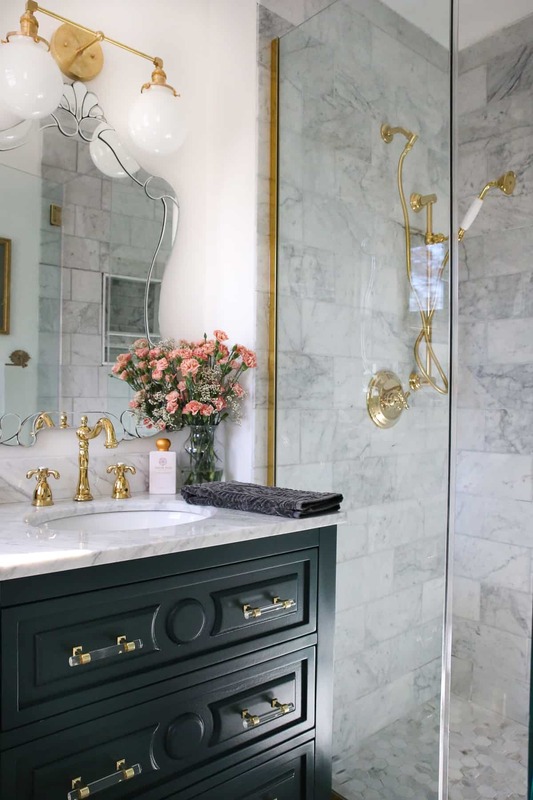 + Vintage elements such as an antique gold frame and art, vintage-style shower and sink hardware from Kingston brass, an antique brass lighting fixture, and vintage Anthropologie wall hardware. 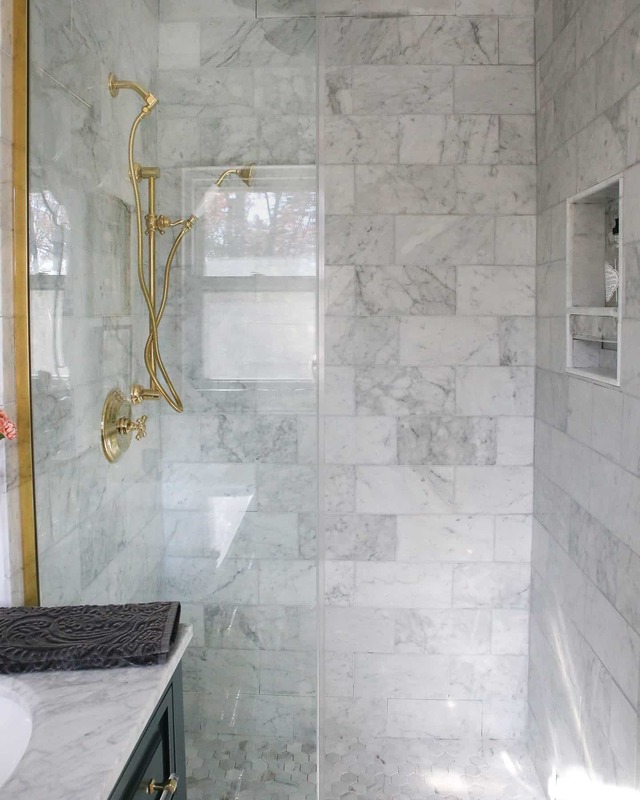 I knew I wanted a marble shower and went back and forth between a white marble or a gray marble. 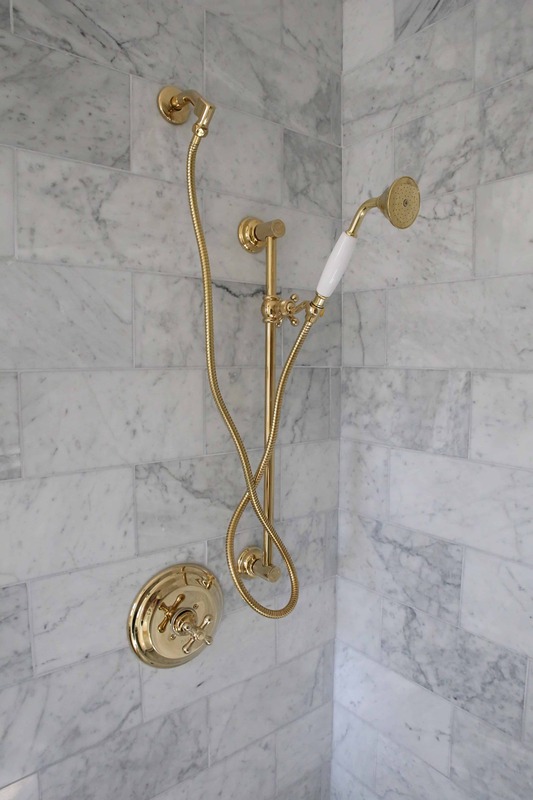 We ultimately chose this beautiful honed Carrara and am infatuated with the look against the shiny brass hardware. I spent ~30 hours over the course of 3 days tiling the shower walls and for my first time tiling, I don’t think it came out too bad. 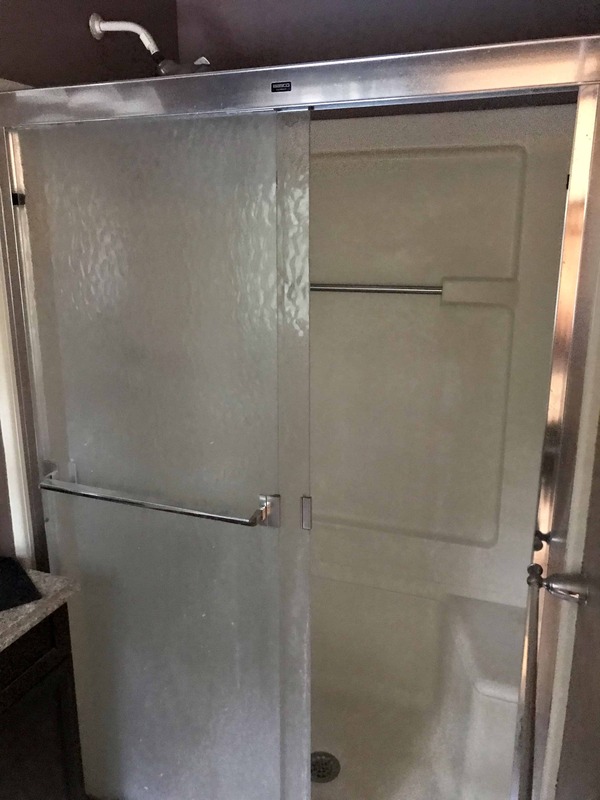 We also knew we needed a glass door and I initially thought we could find a ready-made glass door online. 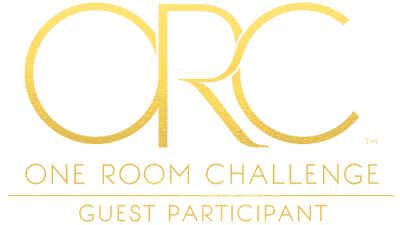 I soon came to the realization that the door had to be customized for our space and to also match all of our shiny brass fixtures. 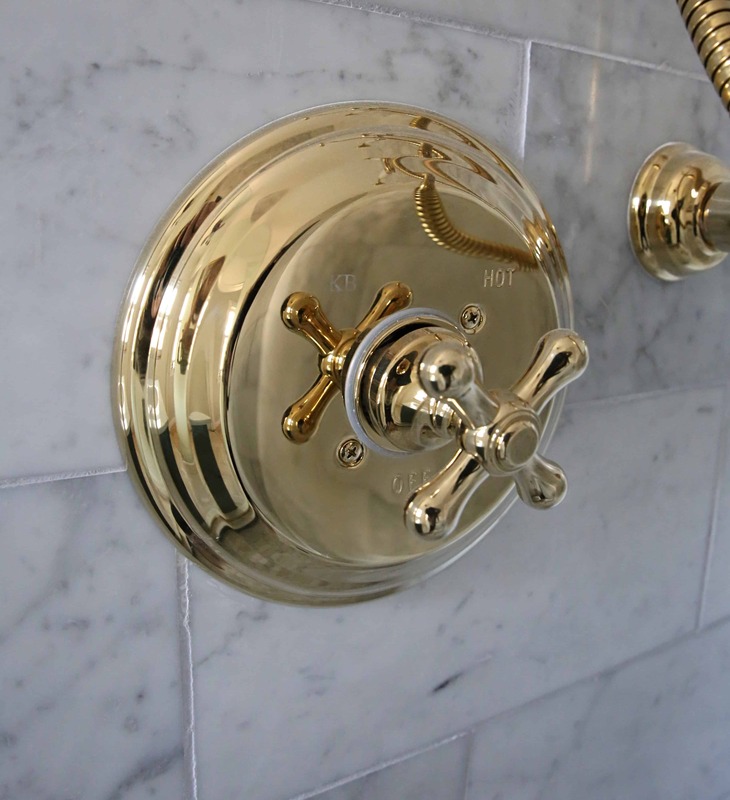 It was well worth the splurge and I’m so excited that the shiny brass look is consistent throughout the bathroom. 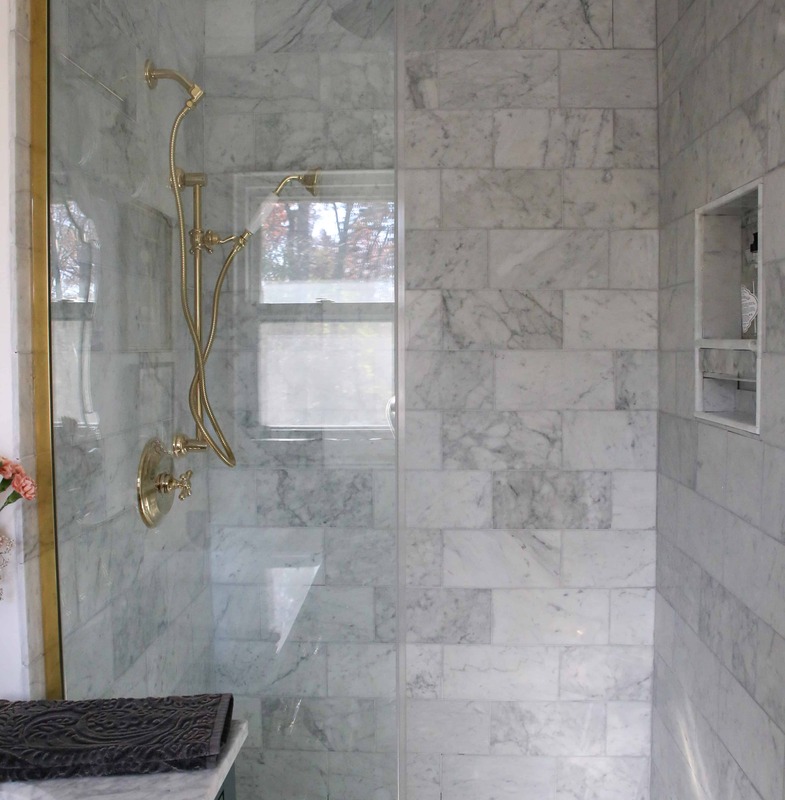 I was also itching for marble flooring but didn’t want the marble to match the shower. I also loved the faux wood look, but couldn’t find a tone of wood that I loved. So, lo and behold just a few days ago, I spotted this white Valentino marble from Floor & Decor and knew it was the one. It has a beautiful wood-like look to it but it’s fulfilling my fantasies of an all-marble bathroom. 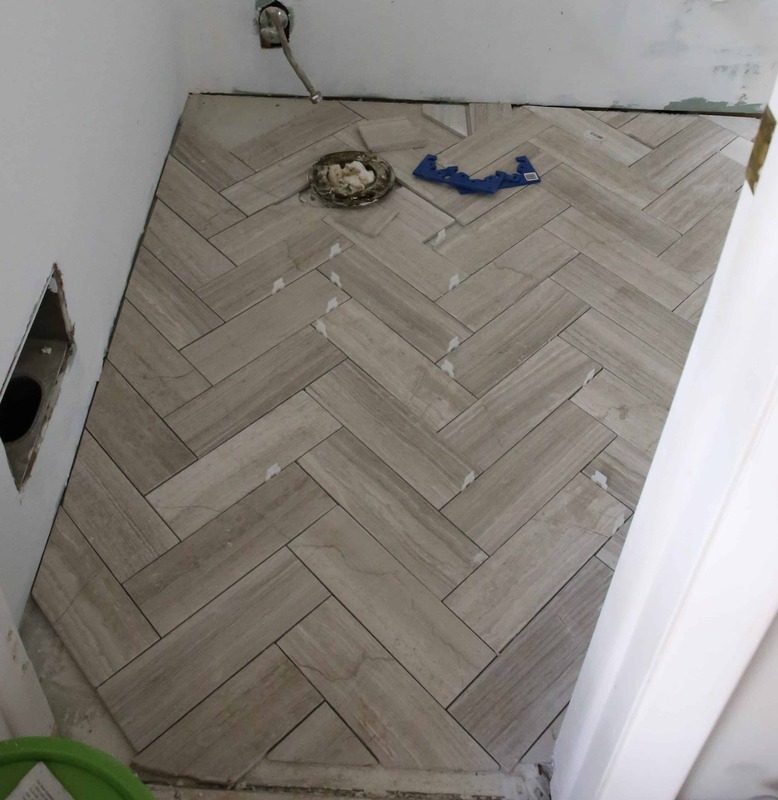 As my first time installing herringbone tile and it took a little extra time and effort, but it was so worth it. 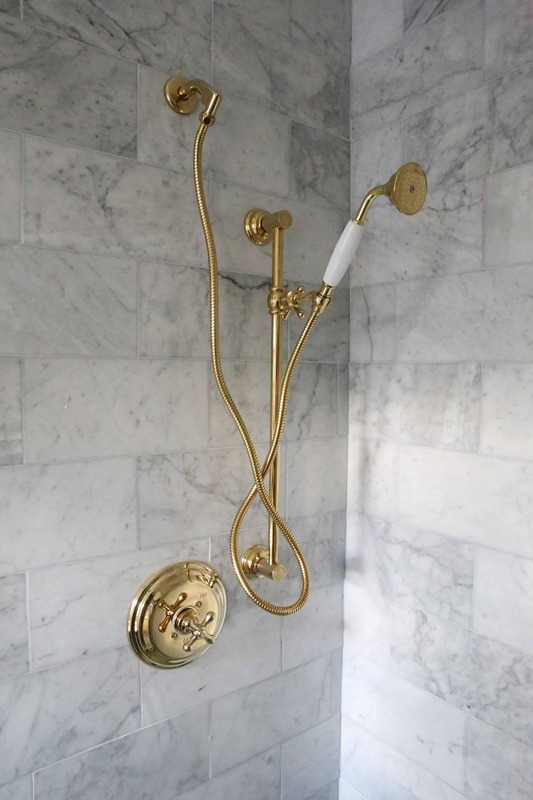 It’s the perfect contrast to the gray honed Carrara in the shower. I couldn’t decide on whether to purchase a cheaper vanity that made less of a statement or just splurge and get the vanity that has the intricate details I needed in my life. 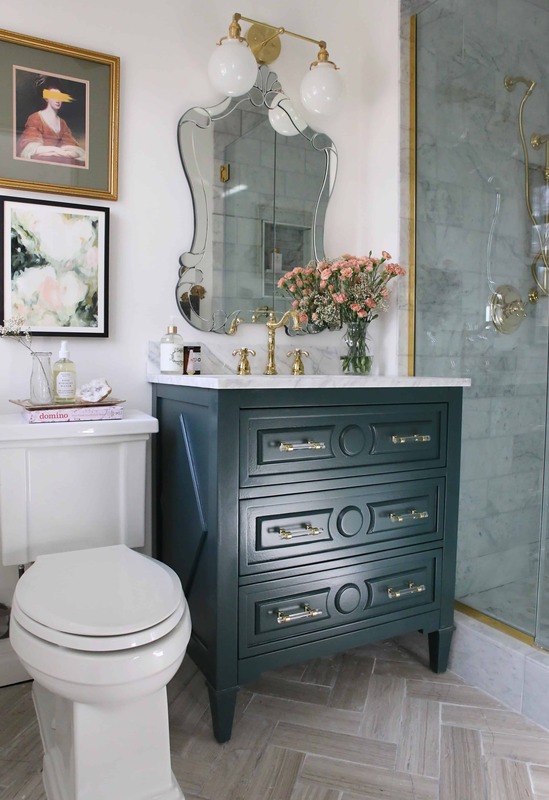 We ended up splurging and couldn’t be happier with the vanity – it is the focal point of the bathroom. I knew I wanted to paint it a deep green and in between tiling, I ended up spraying four coats of BM Salamander. After messing up the first two coats using a cheap sprayer, I finally just bought a critter gun and by the fourth coat it turned out just fine (thank god cause I was not doing it again). Ugh, I’ve developed a deeeeeep love for Kingston Brass. 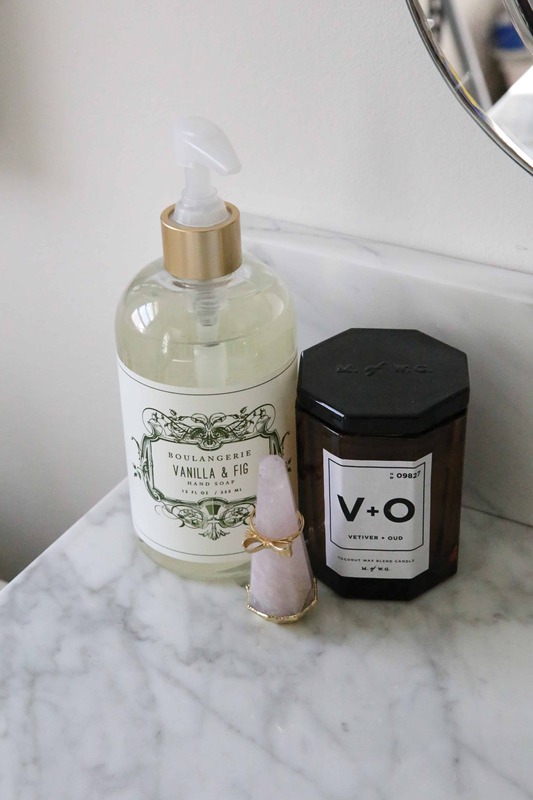 I partnered with them on the hardware for the vanity and shower and could not be more obsessed with their products. I worked with a lovely girl named Rachel and she was so patient with me while I figured out HOW the hell our bathroom worked (wait, I can’t use our valve from 1965 with your 2018 faucet)? 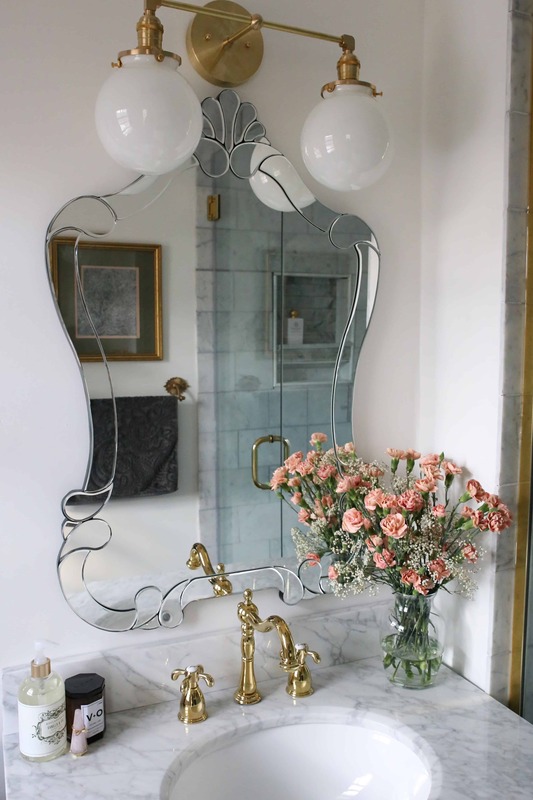 As a sucker for all things gold and ornate, I knew this mirror had to be different than the other two statement makers in our home. 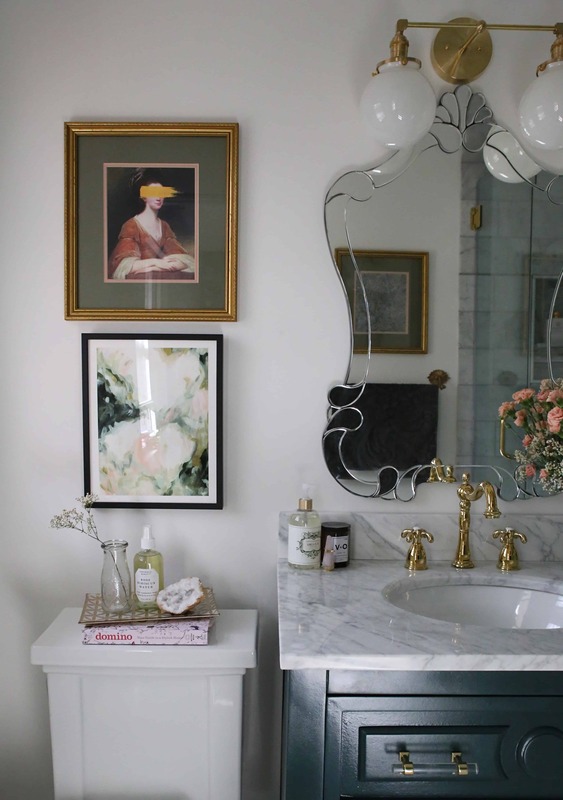 I love the Venetian mirror look and found this mirror for less than $200! For the sconce, I looked hi and lo for the perfect light but couldn’t find something I loved. Then one night I stumbled upon this stunner via Etsy and didn’t even think twice about the purchase. I guess that’s how you know it’s the one? 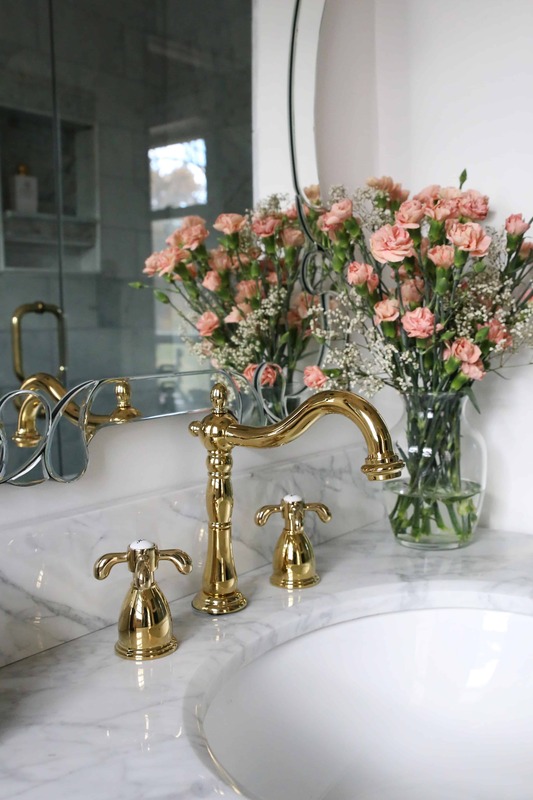 This may be a strange thing to say but, our toilet is so pretty. 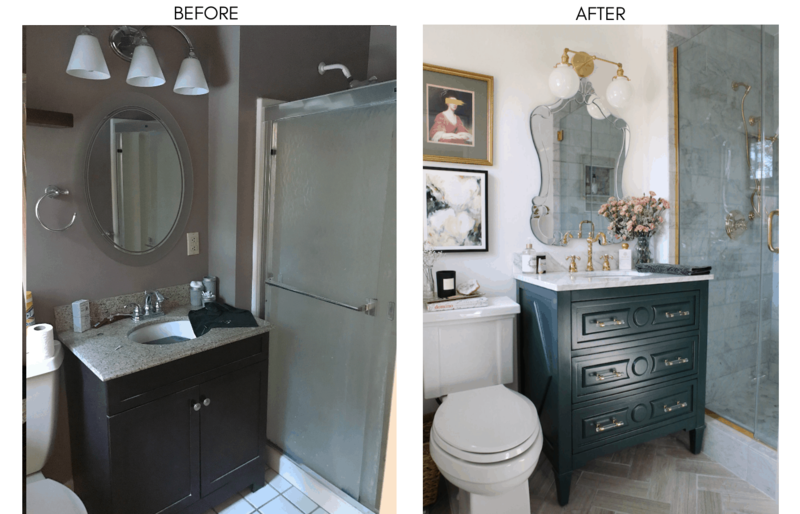 I searched for one that was sleek, modern and just the right size for our small bathroom and I fell in love with this Kohler toilet from Joss & Main. I replaced the silver toilet handle with a shiny brass one to maintain the shiny brass look throughout. If you’re looking for a toilet, Wayfair has this great article on everything you need to know about buying a toilet. 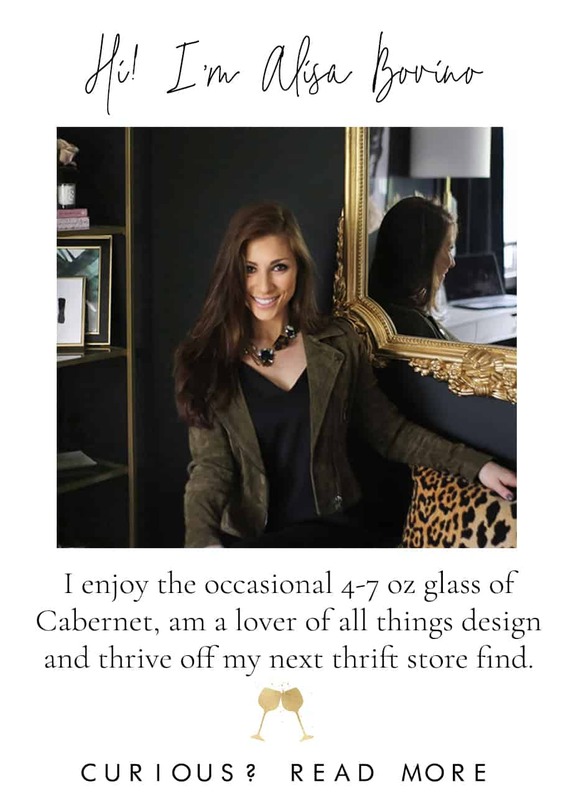 I was told by the lovely Metrie rep I worked with that there was a Metrie warehouse FIVE minutes from my house. There’s only 3 on the East Coast, so this was exciting to me. Luxe Parisian? Enter… moldings. Unfortunately, we couldn’t get everything installed for the reveal but the rest of the trim will be going up within the next week or so! 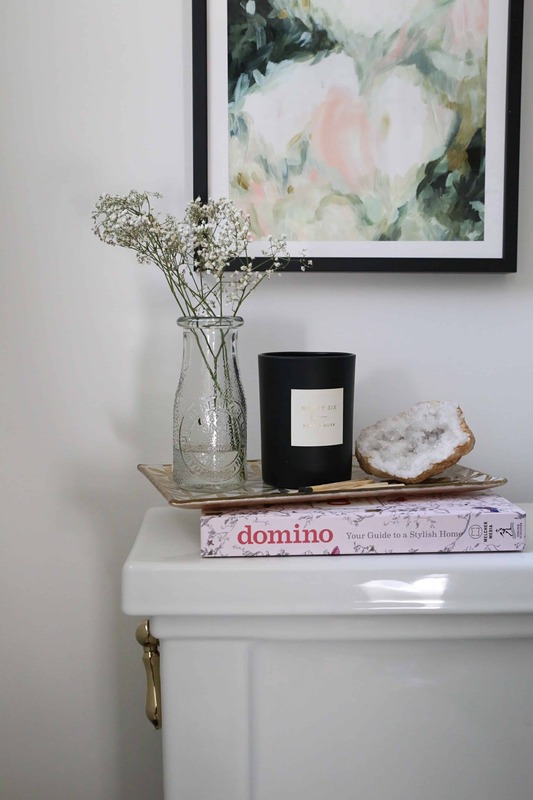 I partnered with Minted on the art and love both options I chose (above the toilet and on the opposite wall, through the mirror). At the 11th hour, I also chose this unique and bold art by on Etsy and think it makes a great statement. 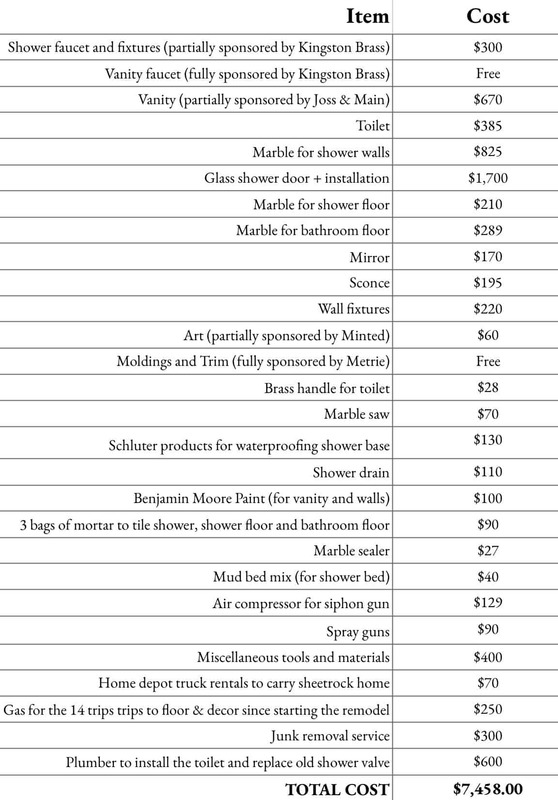 From day 1, I wanted to include a breakdown of costs, including everything we bought in relation to this remodel. That’s right, full transparency of the finances. 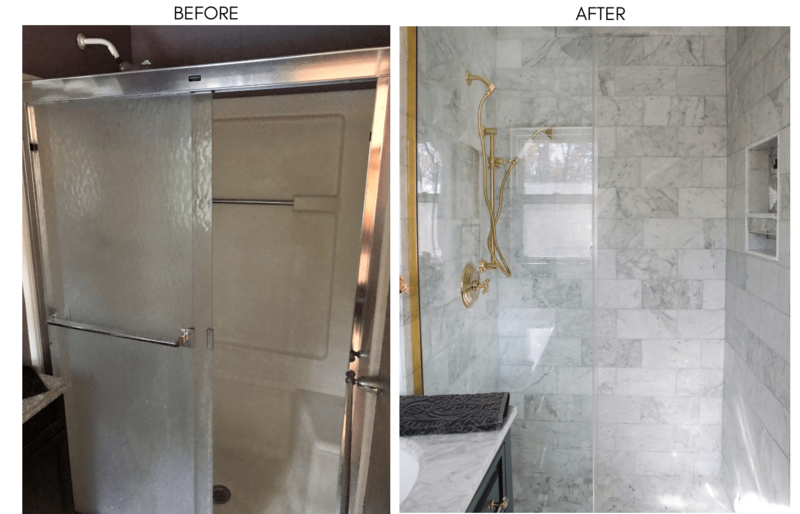 Before this project, I stumbled upon only a handful of blogs who disclosed how much their bathroom renovations cost and it was insightful, especially for someone who’s never been through it before. 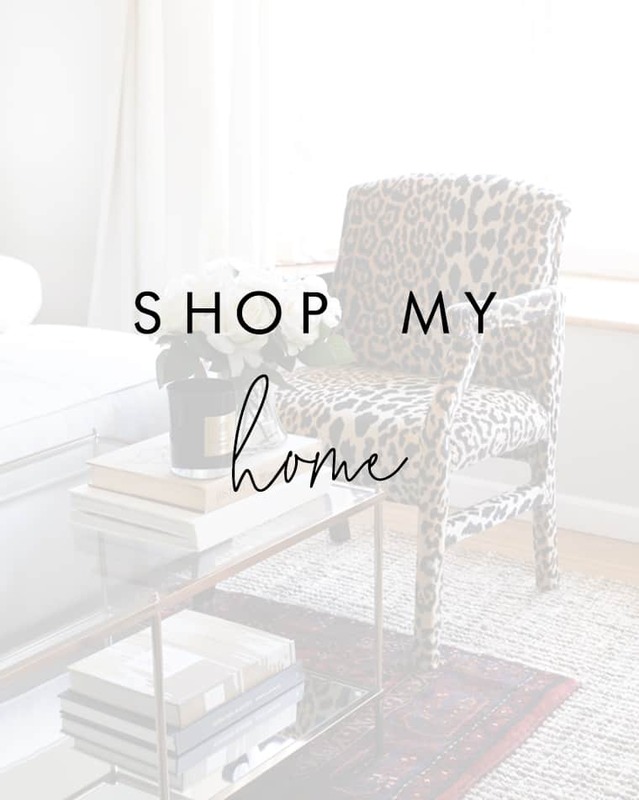 I have to say I am very grateful to have worked with various companies who either provided me with a gift card, a coupon code or completely free items for our remodel. 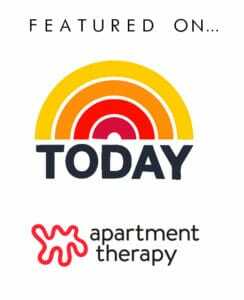 I’ll list out what was sponsored below. 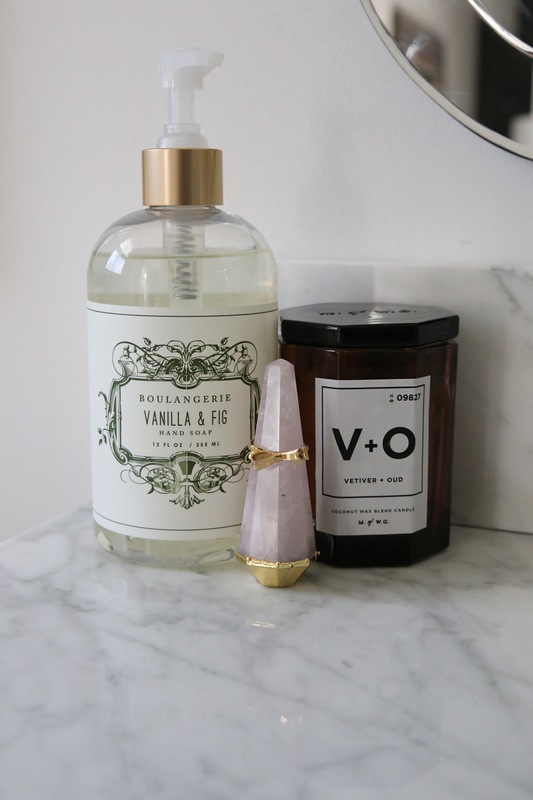 Worth the time, stress, permanently scarred hands, and mortar dust clogged pores? Beautiful. 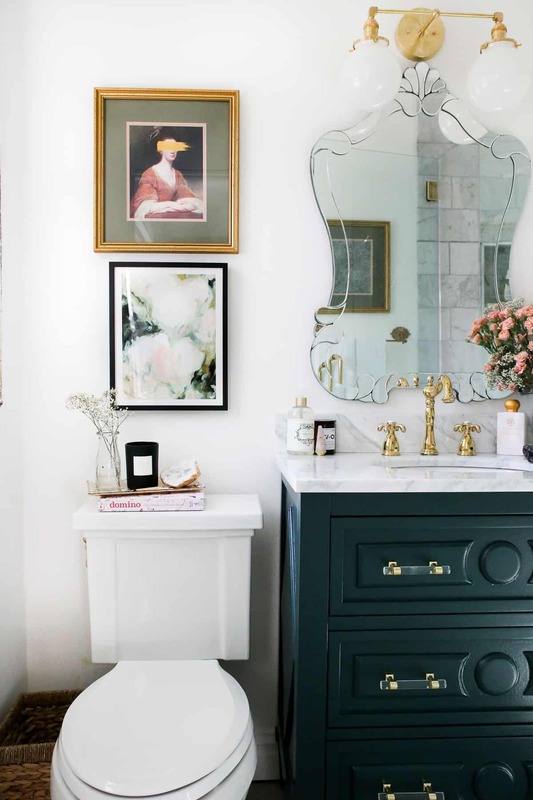 The green vanity cabinet next to the plumbing fixtures make the whole room pop. Enjoy your new bathroom! Everything is so beautiful. 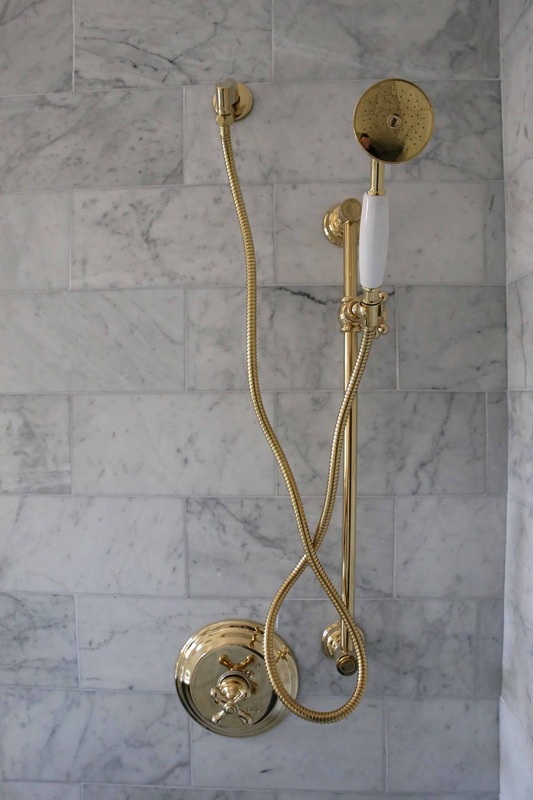 Love the pops of gold and marble. You inspired me to paint an accent wall in my home office green and it turned out soooo beautiful! Thank you for all of your inspiration. Thank you Keyonna!!! Oh my gosh that’s so amazing!!! I love that you have a green accent wall. Maybe I’ll paint a room green for my next ORC LOL! HOLY COW!!!! This is spectacular in every way! 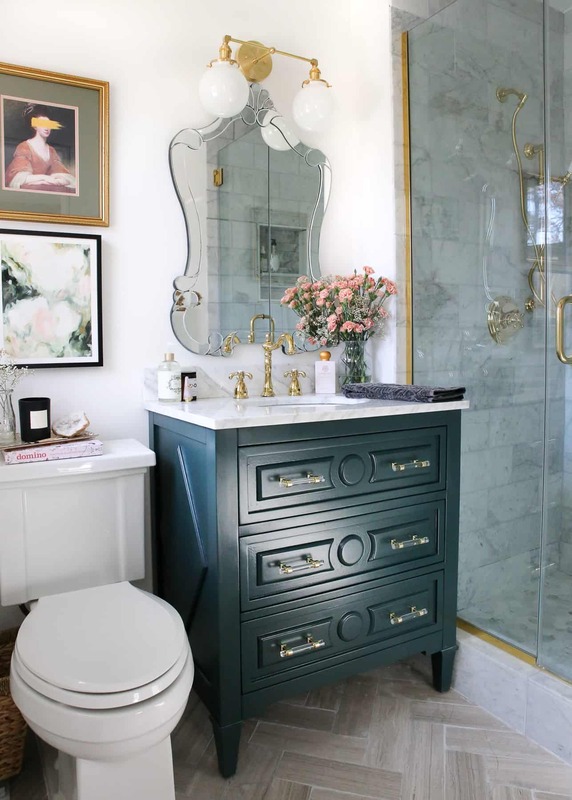 You are my bathroom design hero! 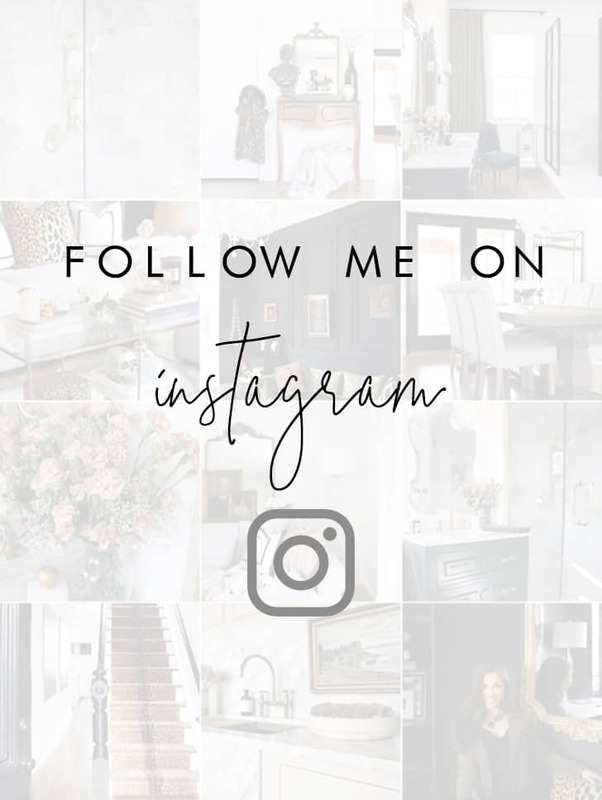 I’ve been following along on Instagram stories, and let me tell you girl…WORTH IT! This is GORGEOUS. Good job! Gorgeous bathroom !! love the floors great job !! Well shoot! This is beautiful! I’m loving the colour palette and the finishes you chose. I also super appreciate that you put the total cost up. We’ve got some bathroom renos on the horizon! 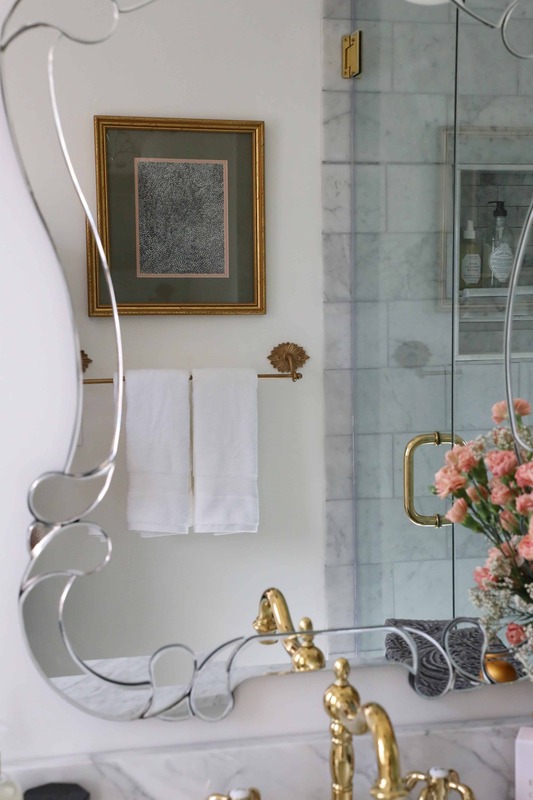 Love the bathroom-It’s stunning! Where did you get the portrait of the woman above the toilet? I think you referenced Etsy-do recall which vendor? Beautiful bathroom.. 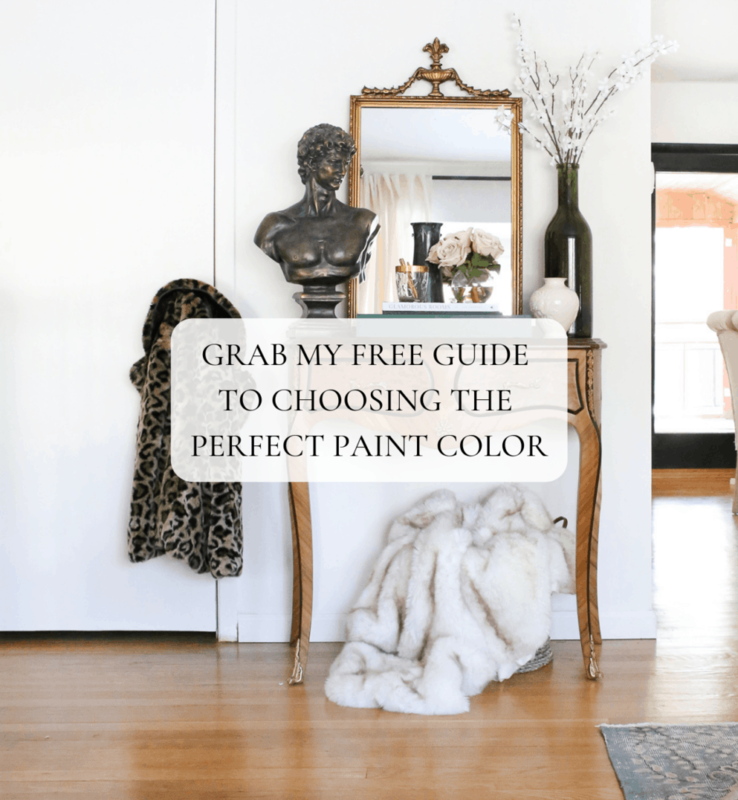 Wondering what paint color you used on the walls. Hi Ann!! I used BM Simply White! Love it! 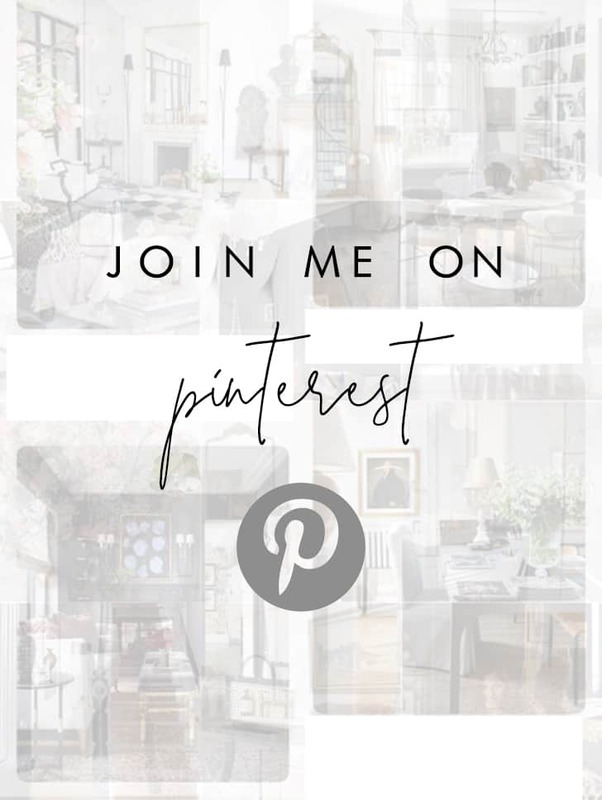 Could you please share the name of the Etsy store for the sconce? I’m clicking the link but page cannot be found. Thank you!